GSBTB Open Music School student Renzo D’Andrea writes about how learning to play music has helped him connect more deeply with others. Sometimes, it seems all we do is talk. We might think we are good at talking – at getting our opinions out there. Maybe some of us are pretty good at it at the right times. But what about when we try to listen? To others’ feelings, fears, hopes dreams, frustrations… this is probably something we could all work on a bit: putting our egos aside and just listening to one another in order to really connect and empathise with other people. So, why I am I deciding to talk right now? I want to talk about my experience with music and how it has helped me to start listening and connecting, as well as playing. 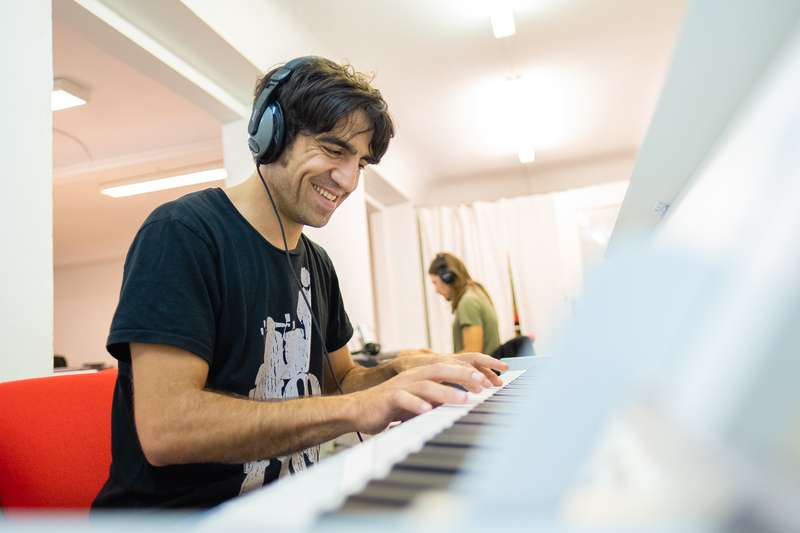 The GSBTB Open Music School (OMS) is just one of the powerful social outreach projects organised by the Give Something Back to Berlin social engagement platform. Since I joined the OMS in March 2017, a flurry of thoughts about the project’s impact and overall message haven’t stopped swirling around my mind. So, I thought it was time to pour them out and share them – it’s time for me to connect the dots and write about what it means to me and the other students. The OMS is a nervous system; it connects people in a creative network. Teachers embrace the students regardless of their level of mastery and give them the space to be creative. This creates an environment in which people feel they are safe and are happy to talk, hang out, connect and, perhaps most importantly, listen to each other. It is a journey, and you are simply free to make the best out of it. The opportunities this offers the students are profoundly inspirational. 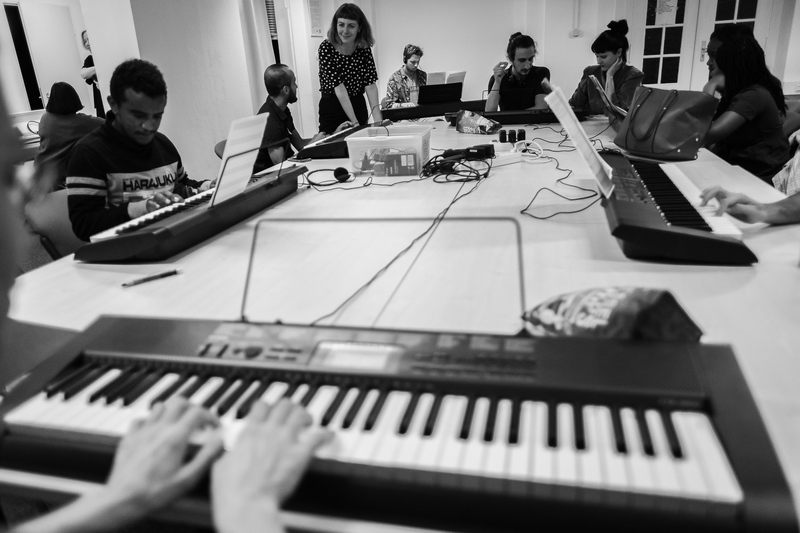 A glance into the Open Music School’s piano class. I initially joined the piano lessons – which take place every Tuesday at 18.30 – and this encouraged me to buy a second-hand keyboard so that I could practice more at home. But I still wanted to take my music education further. In April 2018, I joined the bass guitar class – Wednesdays at 18:30 – to make use of the bass guitar I had at home that had been silently screaming for me to play it, rather than just giving it some evasive eye contact whenever I walked past it. What does OMS mean to me, then? Inspiration, culture, experimentation, making connections and having the space to work on my craft. For me, the OMS is about learning and practising empathy. I consider music – the art that is conveyed in sounds – one of the core messages that all beings are involved with. Learning music is about observing ourselves, hearing how we play notes and create rhythms while following a tempo, but it’s also about communicating with the people playing with us, or those who are listening to our songs. I recommend trying to translate this into your daily life. Ask yourself, “what inspires me to express myself, make progress and connect with others?” If you’re a bit unsure, know that you are always welcome at the GSBTB Open Music School, where you are sure to find some inspiration. Renzo D’Andrea is a business innovation coach who learns piano and guitar at GSBTB Open Music School. Photos by Jess Haverkamp.